Many people have misconceptions about which kinds of dogs are actually inclined to bite or attack, as well as what you should do if that does happen. But Early Show Contributor Debbye Turner, who is also a veterinarian, has some advice. Most of us don't really think about getting bitten or attacked by dogs in our daily lives, but it can happen a lot more often, and quicker, than you'd ever think. Part of the problem is that we are led to believe that there are certain types of dogs that are extremely aggressive and vicious (like pit bulls) when, in fact, some of the breeds that are more likely to bite are those you'd never think about, like poodles or terriers. All dogs can be provoked to bite. There is really no such thing as a "bad breed." Most (if not all) dogs can be properly trained and socialized to be gentle and tolerant. Your dog should be trained to obey basic commands: sit, stay, come, and down. This alone could prevent many dog-biting incidents. "Pit bull" is a bit of a misnomer. There really is no such breed. Generally, "pit bulls" are a cross between a "bulldog" breed and a terrier. They are also known as American Pit Bull Terriers, American Staffordshire Terriers, and Staffordshire Bull Terriers. Most "pit bulls" are not aggressive by nature. They tend to be gentle, playful and loving. However, there are those that have been bred and trained to be aggressive. Even then, they are more aggressive toward other animals, not people. 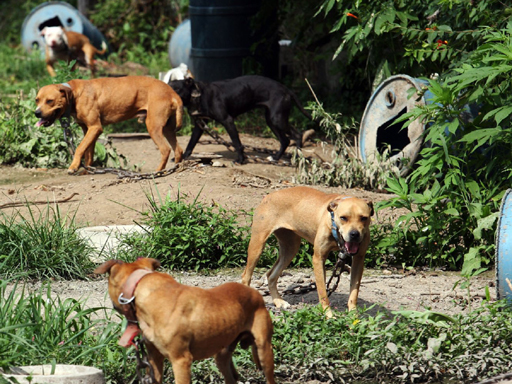 Often, aggressive "pit bulls" have been abused and/or neglected. These are VERY dangerous. Try to take food or toy away from him. NEVER bother a dog while he is eating. The most common situation where a dog bite occurs is while a dog is eating. Playing "tug of war" with a dog. Many dogs interpret this as aggression. If they "win," they feel empowered. If they feel threatened, they may try to retaliate. "Surprising" a dog. (sneaking up on him or startling him while he is sleeping). Often, the dog's defense mechanism will kick in, and he will bite in self-defense. "Rough housing" with or other sudden movements toward the dog's owner. Many dogs will see this as an attack on his owner, and will attack you to defend the owner. Ignoring their warning! If a dogs barks ferociously or growls when you approach his territory, bed, etc. and you continue, that is an engraved invitation to get bitten. They are warning you that they don't like that and stop. Listen! Inappropriate touching. Dogs generally don't like their ears, tail and feet tugged. Some don't like being inverted and rubbed on their belly. This is a position of submission and an aggressive dog will resist this "challenge" vigorously. First, get the "okay" from the owner. Hold out your hand, fingers closed, palm down, slowly toward the dog. Allow the dog to approach your hand and sniff it. Wait for the dog's "okay". If he wants your affection, he will lower his head, perk ears, or even come closer to you. If the dog puts his ears back, flat on his head, or growls, or cowers, don't pet him. Pat the dog on the top of his head, or along his back. Avoid touching his belly, tail, ears, or feet. Don't smile. The dog thinks you are "baring your teeth" at him. This is an invitation to fight. Respect the dog's wishes! If the dog is barking and growling, he is expressing his definite displeasure with your actions. Don't push the envelope. Most dogs make good on their warnings! Don't move! You cannot outrun a dog, no matter how fast you are. Running only provokes an angry dog. Look away. Staring an aggressive dog in the eyes is a challenge. Use a soft, soothing tone of voice. Loud, angry-sounding words and screaming only spur on the dog. Keep your arms to your side, with your fingers curled in so the dog can't bite them. If he bites you, DO NOT PULL AWAY. This only spurs the dog on. Remain calm. Try to ram a stick, broom handle, etc down the dog's throat to make him gag and let you go. Don't hit the dog. Again, that just makes the situation worse. If you are on the ground, curl into a fetal position. Cover your head and neck. Lay perfectly still. Usually a still target is boring to the dog and they will retreat.